Theresa Jernagan Everhart, of Tallahassee, passed away peacefully on Wednesday, August 13, 2014. 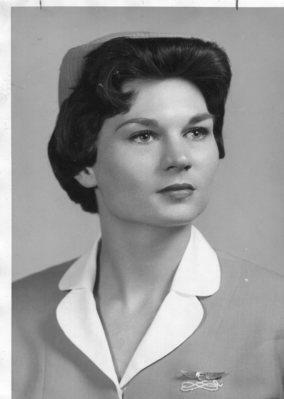 The daughter of deceased parents, Margaret Russell and Monroe Jernagan, she was born on September 18, 1941. Theresa attended Leon High School and Fairfax Hall in Waynesboro, Virginia. While in her early 20s Theresa moved to Chicago to become a flight attendant for United Airlines. Over the years she resided in Miami and West Palm Beach before returning to Tallahassee in 1999. She worked for many years as a Paralegal with Broad & Cassel Law Firm. Theresa attended St. John's Episcopal Church with her close childhood friend, Mary Lee Robertson. Theresa's survivors include her father Lee A. Everhart, who lovingly adopted her in 1954 when he married her mother, and his wife Marie Mills Everhart. She has two sisters, Lee Ann Everhart and Susan Everhart McAlister, nephews Jordon L. McAlister and Lee E. McAlister, step-sister Dana Herman (Barry) of Winter Park, Florida and their children AnnMarie and Avery. Theresa also leaves behind a host of wonderful friends, and will be remembered for her vivacious nature. It was often said that "she never met a stranger." She had a keen eye for fashion and enjoyed decorating and updating her home. Funeral Services for Theresa will be held Tuesday, Aug. 19th at 2 PM, at St. John's Episcopal Church, 211 N. Monroe Street. Family will greet friends at a reception following the service. The committal service will follow at Culley's Meadowwood Memorial Park. In lieu of flowers the family has asked that donations be made to Big Bend Hospice. Arrangements entrusted to Culley's Meadowwood Funeral Home.